Tomorrow’s election could be the most important of our lives. It’s become a referendum on Donald Trump’s vision for America, and a huge turnout is expected even in solidly blue and red districts. Here are my predictions for national, selected state, and Bay Area races. Given the emotions surrounding some of these contests please note I predict who I think will win, not who I want to win. I see Democrats flipping the House for two reasons. First, Democrats have outperformed expectations in virtually every special election since Trump took office. Second, voters supporting Democrats are far more motivated; I haven’t heard many Republicans claim that tomorrow’s election is the most important of their lives. I have no special insight into whether Democrats will retake the Senate. I see Andrew Gillum winning the Florida Governor’s race because he’s run a very strong campaign against a terrible Republican. I believe Stacey Adams would win the Georgia Governor’s race absent massive voter suppression, but cannot predict this denial of voting rights will not occur. The only race of national interest I have carefully studied is Beto O’Rourke’s challenge to Ted Cruz in Texas. I predict that win or lose, Beto becomes the frontrunner for the 2020 Democratic Presidential nomination. He galvanizes support as no Democrat has since Barack Obama in 2008. His career path is similar to Obama’s, with the key difference that Obama was a heavy favorite to defeat his Republican opponent in his 2004 Illinois Senate race. No Democrat has won a statewide race in Texas since 1990. A major reason is that Democratic donors have not made the investment in Latino voter registration and outreach that is a prerequisite to turning the state purple, if not blue. Yet Beto enters Election Day trailing Ted Cruz by 3.6% in one poll and tied in another. He has energized Latinos and young people as no Texas candidate has in decades, which will alter the conventional turnout assumptions upon which polls are based. Ted Cruz is the least popular incumbent that will appear on any ballot this election cycle. He lost reliably Republican newspaper endorsements and has done nothing to excite his base. I was recently in Texas. Insiders all saw Cruz winning despite all of the above. Most can barely remember the 1990 election that brought Democrat Ann Richards to power, but vividly recall election after election where a Democrat was projected to win or come close but fell far short. I realize Texans will roll their eyes at this, but I’m going to defy the state’s recent history and pick Beto O’Rourke to win. With either a narrow loss or a victory in the solidly red state of Texas, Beto O’Rourke becomes a force to be reckoned with—-he would start a presidential campaign with the strongest national following and largest small donor list of any potential candidate. There are likely more housing funding measures on state and local ballots this November than in any prior election cycle. California’s $4 billion Prop 1 is the biggest, and the state’s Prop 2—which reallocates $2 billion from a prior approved ballot measure to go for homelessness prevention—is the second largest. Austin has a $250 million housing bond and Portland, which passed a $258 million affordable housing bond in 2016 is part of a Portland Metro area bond for $652 million. Oregon has a state measure, Prop 102, which could almost double affordable housing through allowing new government borrowing practices. As the affordable housing crisis now prices out working and middle-class families—-my new book, Generation Priced Out: Who Gets to Live in the New Urban America identifies how to expand housing for these groups—politicians are responding by placing housing bonds on local and state ballots. I see all of these housing funding measures winning—and will report on the outcome of these contests in Wednesday’s edition. There are three major measures on California’s ballot. Prop 5 would give older, wealthier homeowners yet another tax break at the rest of the state’s expense. While it is always risky to predict the defeat of a property tax savings measure (given the disproportionate voting power of older homeowners), I think the projected large state turnout will narrowly defeat Prop 5. I see Prop 6, which repeals the gas tax, also losing. I explained last week why Prop 10 was trailing in polls yet was a major step forward for tenants (See “Why Prop 10 Has Already Won”). The astounding level of falsehoods and misinformation purchased by the No on 10’s $75 million campaign could not be overcome. Countering these lies and distortions.required a powerful mainstream figure calling them out. As I write in The Activist’s Handbook, the number one rule for winning ballot initiative is “Keep it Simple.” Landlords never could have won a ballot measure imposing the complex terms of Costa-Hawkins, which includes three entirely distinct provisions: preempting localities ability to impose rent control on vacant apartments, excluding single-family homes from rent control, and exempting new construction from rent control. Prop 10 tried to keep it simple by a clear call for repeal, but the complexities of Costa-Hawkins makes a full repeal via initiative a very steep political challenge. The No on 10 campaign reminded me of some critical facts. First, a lot of voters still oppose rent control itself.. Second, although eliminating vacancy control did not produce massive new housing construction as landlords predicted, the myth that rent control stops new construction remains. Third, many people fail to connect Costa-Hawkins’ passage in 1995 to California’s current unaffordability. They do not recognize the reason eight real estate magnates contributed over $30 million to No on 10; Costa-Hawkins is an engine for rising rents. Considering that Costa-Hawkins was always primarily about ending rent control on vacant apartments, a 2020 ballot measure that only restored cities right to impose vacancy control is worth considering. It would avoid issues about new construction and take homeowners out of the measure entirely. This has been a difficult election season in San Francisco and other blue cities because voters are focused on the Trump nightmare. It’s understandable that more San Franciscans are phoning precincts to flip the House than are working on local supervisor campaigns. The one local measure that has broken through the national focus is Prop C. Thanks to Marc Benioff’s support, Prop C has transcended its doubling city homelessness funding and raised larger questions of corporate responsibility for addressing this crisis. I’ve been decrying the lack of public money to address homelessness since 1982. Benioff has done more to educate the public about this issue than anyone else during this time. By calling out other executives and companies for not doing their fair share, Benioff’s stance could become a watershed moment for corporate leaders nationally. We have waited decades for the federal government to house the 75% of Americans entitled to federal housing assistance but who do not receive it. A federal war on homelessness is not happening anytime soon. We need corporate leaders to step up. I originally felt the only obstacle to Prop C winning was massive outspending by the opposition. Thanks to Benioff and Salesforce, that didn’t happen. Yes on C has actually outraised its opposition, which has to be a first in the history of any city’s local tax measures. 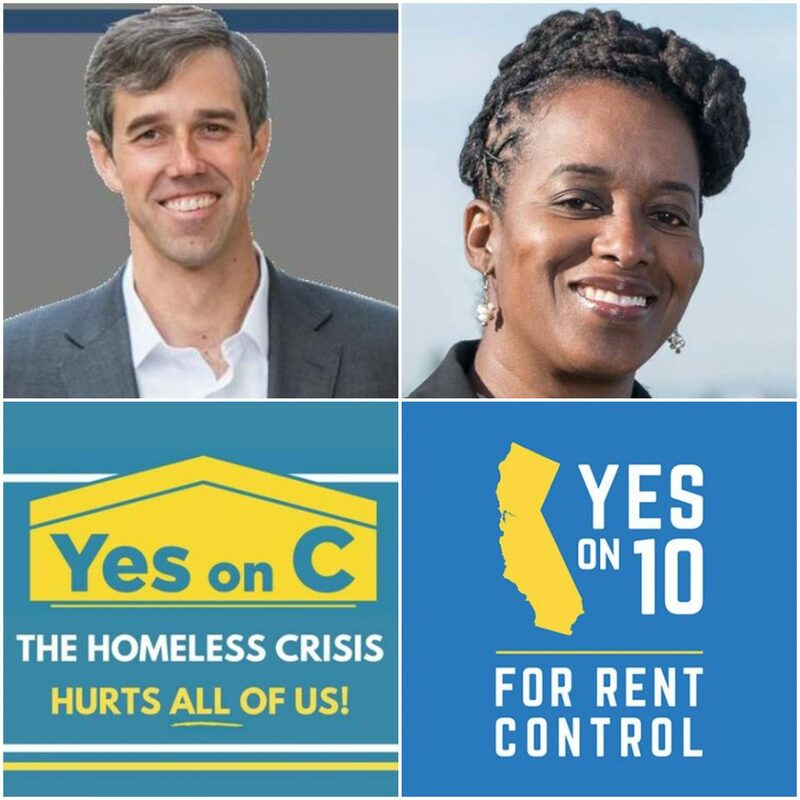 Many have asked me why Mayor Breed came out against Prop C. I think it was a combination of bad political advice and her feeling that she had gone all in to fund homelessness for June’s “Housing for All” initiative, Prop D. and could not get the politicians and groups backing Prop C to come on board. Had Breed foreseen Benioff’s support for the measure it is very unlikely she would have opposed it. Prop C will win handily. It will be the big national news story coming out of San Francisco after the election. The biggest surprise in San Francisco’s modern history of district elections was Mark Farrell’s 2010 win over Janet Reilly. I am going to go with my gut and predict another upset in 2018: I see Nick Josefowitz defeating appointed incumbent Catherine Stefani. True, Stefani has nearly all the big endorsements. And few if any negatives. Yet the main argument I have heard against Josefowitz—-that he is wealthy and using his money to “buy” the election—could have been leveled against Gavin Newsom, Michaela Alioto-Pier and Farrell. Yet District 2 voters elected them all. Josefowitz has offered a lot more ideas for San Francisco’s future and would have a much higher profile on the Board than Stefani. I’ll take a flier on him as my upset choice for the Board. I wrote a year ago about progressives’ ill-conceived opposition to cannabis (“Why Is Liberal SF Blocking Cannabis?). If Gordon Mar really believes cannabis businesses pose a threat to his family, he is uniformed. This is obviously about Mar trying to secure right-wing Chinese-American support for his campaign. Mar’s supporters are also attacking Ho for backing a Westside Navigation Center and for committing to allow housing built to current zoning standards. I wrote a SF Chronicle op-ed about how “progressive” San Francisco often opposes housing for the working and middle-class. D4 “moderates” Ho and Trevor McNeil are pushing to build such housing and supporters of the progressive candidate are aligning with those committed to elitist and exclusionary zoning. I don’t think voters will buy it. I see Ho winning in D4. I explained last month why I thought this race was “going down to the wire.” Predictions are complicated because the D6 boundaries and electorate are vastly different from the last contested race in 2010. No district has more newcomers than D6 and no district has more voters who have never cast a ballot in a contested district supervisor race. If you want to read about the candidates backgrounds, use the Search Box to access my prior stories. At this point, it’s all about who is going to win. One year ago, Matt Haney was the clear frontrunner. He had a lock on the Jane Kim constituency along with money, endorsements and campaign experience. Sonja Trauss was thought to have so little chance to win that those seeking a challenger to Haney recruited Christine Johnson to enter the race. Today, recent polling confirm my own observations: Trauss is surging. Her extraordinarily dedicated volunteer base combined with Johnson’s popularity gives the Trauss-Johnson team a 50% chance to win (I say “team” because they have urged their supporters to make the other their second choice). If Trauss and Johnson supporters use ranked choice voting as effectively as Mark Leno and Jane Kim did in June, one of them, likely Trauss, will win. But if their supporters do not make second choice votes, or give that choice to Haney, he will win.. While Theo Ellington has run a strong campaign, Shamman Walton simply has too much support to be overcome. Walton wins. I most recently assessed this race on October 9, when I concluded it was a tossup. Last week a poll from a moderate-conservative EMC Research firm found Beckles ahead 43%-39% with 17% undecided. Over $3.4 million has been spent on a race between two Democrats who would vote the same on most issues. While backer see huge differences on key issues (Only Beckles endorsed Prop 10 and Wicks is far more favorable toward the state’s power to overcome exclusionary zoning), I see this race coming down to the big picture of how the candidates got to this point. Wicks has not been able to escape the perception that she is an interloper who has decided to use her national connections with Team Obama to launch her political career by winning an Assembly seat. In contrast, Beckles has followed the usual career path for legislators, as she currently serves on the Richmond City Council. Beckles’ campaign has so successfully attacked Wicks as a tool of pro-charter school billionaires that even former top Obama campaign strategist David Alexrod weighed in on Twitter that he couldn’t believe how unfairly the progressive Wicks was being depicted. In contrast, efforts by Wicks backers to portray Beckles as an out of touch legislator who backed Jill Stein over Hillary Clinton in 2016 have not gained traction. Also helping Beckles is incumbent Assemblymember Tony Thurmond’s race for State School Superintendent. Polls show Thurmond trailing Marshall Tuck, and if Thurmond is to win he needs a maximum turnout from his home base of Richmond and El Cerrito. Infrequent voters going to the polls for Thurmond in those cities will overwhelmingly favor Beckles. East Bay Express Editor Robert Gammon tweeted last week that Wick’s seemingly solid Rockridge homeowner base could be weakened by those “deathly afraid” that Wicks would support the upzoning of Rockridge and other exclusive homeowner neighborhoods. It appears that “progressive” homeowners see Beckles as more likely to oppose new apartments in their upscale neighborhoods, as well as blocking increased density. This could bring Beckles votes that would otherwise be assumed to go with Wicks. Wicks has a tremendous field operation, but it may mean less as voter turnout will be high across the district without volunteer contact. I see Beckles winning this race. Check my Wednesday story for my report on my picks and a broader post-election analysis. Randy Shaw is Editor of Beyond Chron. Pick up his just released book, Generation Priced Out: Who Gets to Live in the New Urban America.